RBVRR Telangana State Police Academy training Sub-Inspector and other rank trainees in Forensic Science techniques using human moulds. A police constable explaining about various kinds of wounds, ligature marks on a body in case of hanging. —Photo: Surya Sridhar. Hyderabad: From DNA profiling to facial recognition, investigation techniques are advancing every passing day. But even then, the importance of conventional methods, those popularised by Sherlock Holmes much before even cops began using them, are indisputable. And it is keeping this in mind that the RBVRR Telangana State Police Academy is training Sub-Inspector and other rank trainees in investigation techniques such as postmortem bruising, analysing burn injuries and so on, all these using human moulds. The Moulds of human body parts, with various types of injuries, are kept at the Dr AC Hankin Museum at the Academy for a ground-level understanding of investigation techniques by trainees. The museum also houses the Forensic Science Gallery, which consists of different forensic science equipment. The accessories and Plaster of Paris moulds are displayed for examination and comparison of biological evidence, tracing evidence, while impression controlled substances, ballistic and other evidence in criminal investigation are also available. “The burning moulds depicting face burns from oil lamp, degrees of different burns, electric burns and colour changes in bruises are displayed here. The trainees will get a detailed understanding of external injuries on various parts of a person which helps them solve a case,” MK Dubey, museum curator, said. Different moulds depicting axe wounds, entry and exit wounds of bullets, suicide wounds, contact wounds, throat wounds, poisoning figure, arsenal poisoning, cardiovascular spam, hanging scene, murder deep wounds, stabbing, shotgun and rifle wounds, exit holes in skull by bullet, all provide the knowledge of the forensic science not only to the police officials under training also to any ordinary visitor. There are also moulds depicting a raped woman, a hand showing the teeth marks of the victim, manual strangulation marks, drowning indications and so on to give learners a deep insight into what they have to look for at a crime scene. “Usually during the scuffle which takes places when a woman is attacked or sexually exploited, in her defence the least she does is bite the predator who attempts to overpower her. These teeth marks on a hand serve as a vital clue. When a person hangs oneself, there will be a ligature mark seen on the throat, which will be different when they are throttled,” Dubey said. 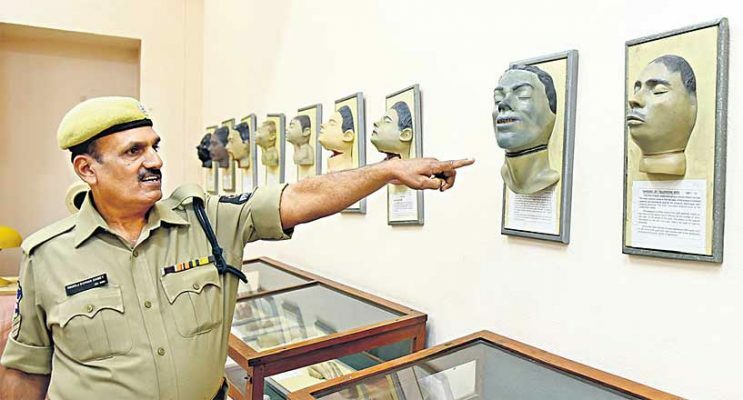 Telangana State Police Academy Director Santosh Mehra said there were many antique and interesting items on display here and youngsters need to know about them, their origin and their importance. “There is a plan to open up the museum for common people. Apart from this, planning to construct a new building and shift the museum,” he said. Due to security concerns, the museum is now only open to school and college students with prior permission.